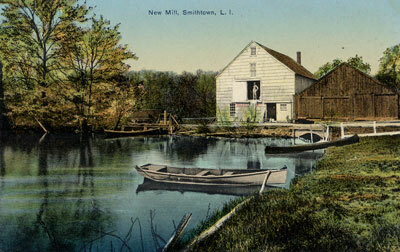 Old Mill at Smithtown, L.I. 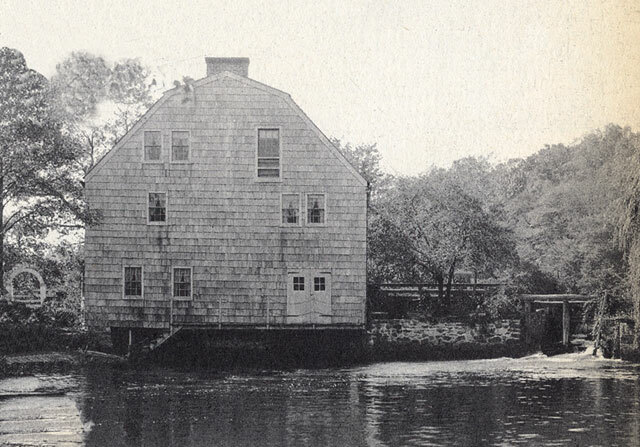 "Grist Mill Head of the River October 1953"
New Mill, Smithtown, Long Island, N.Y. 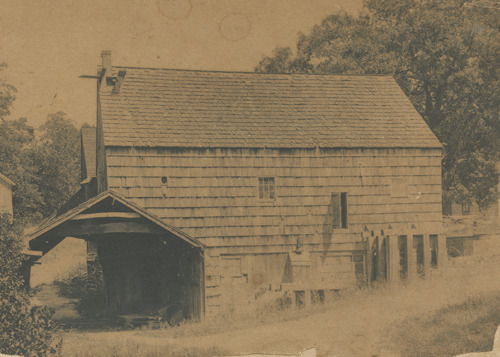 This mill was build circa 1829 on New Mill Road. It is intersting to see the changes between the postcard and the original photograph by R. S. Feather. 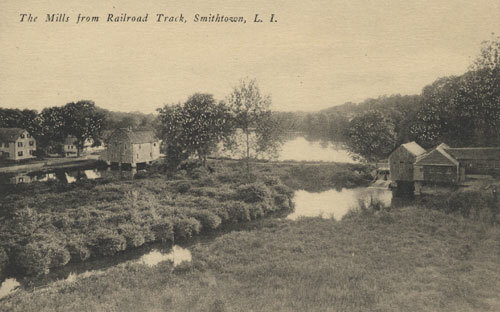 The Mills from Railroad Track, Smithtown, L. I. 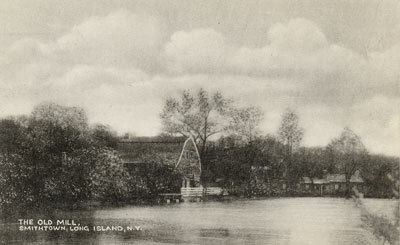 Old Mill View from R. R. Bridge, Smithtown, L. I. "There were three mills — saw, grist, and fulling mills — at the head of the river. The date of the building of the dam was probably a few years before 1725. 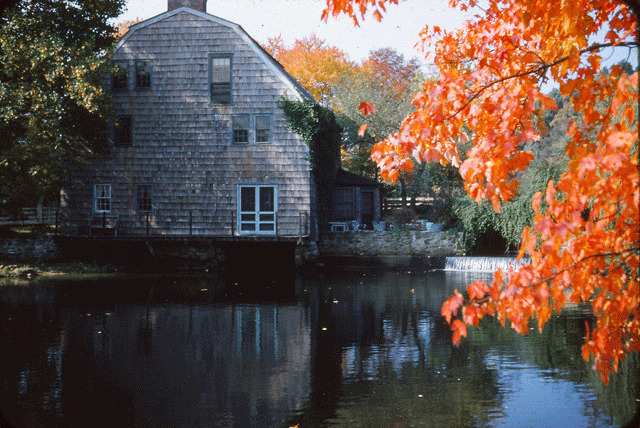 According to tradition, the mills were built by George Phillips, son of the first Presbyterian minister at Setauket. 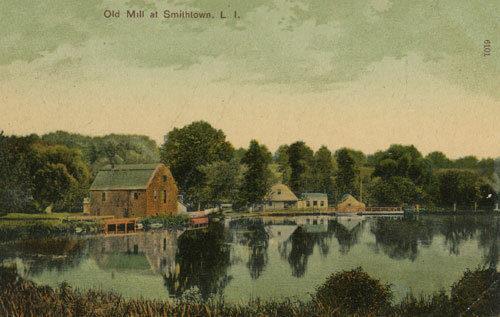 The mills and dam are referred to in Surveys dated 1736. In 1799, Mills Phillips paid to the town £2-12s as quit-rent on the pond. 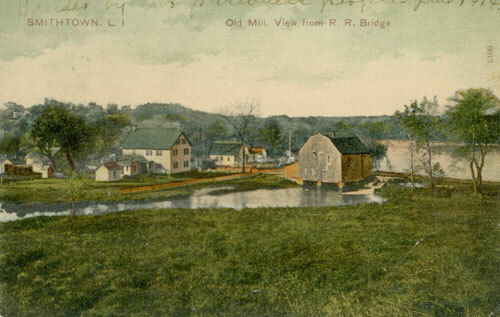 The property on which the dam and mills were built was part of 500 acres conveyed by Richard Smith, patentee, to his son-in-law, William Lawrence, March 28, 1684, "at the common passage over the River Nissequogue." The grist mill pictured above was abandoned in 1909 and until 1927 remained untenanted, the old wooden machinery remaining largely intact. Tin this year it was purchased by Mr. T. J. White. Tow years later reconstruction was begun and the restoration was completed in 1930. Since this time it has bee nused as a guest house." (Ancestry.com) search of "Greenville McNeel" revealed ("stories and publications" hits) the source called: book: "Portrait and biographical record of Suffolk County (Long Island) New York : containing portraits and biographical sketches of p...." pp. 1002 and 1003): 1002): "THE BLYDENBURGH FAMILY. Isaac Blydenburgh, great-grandson of Joseph Blydenburgh, the first settler of that name in Smithtown, was born on the Blydenburgh place at the Branch in 1775. He married Susannah Smith, daughter of Job Smith, and moved to Bushey Neck. In 1798 he built the mill and dam at New Mills, in connection with Caleb Smith and Judge Joshua Smith, whose interests therein he and his sons, Richard and Isaac W., afterward acquired,[sic, should be a period] In 1821 he removed to the house on the [p. 1003] hill, at the end of the Neck, which he built in that year and where he died in 1858. His children were: Ebenezer, Richard, Elizabeth, wife of George Phillips; Isaac W., and Ruth, wife of Timothy Smith. "Richard Blydenburgh, son of the foregoing, was born in 1798 and married Ruth, daughter of Judge Joshua Smith, of Hauppauge. In 1827 he, with his brother Isaac W., built a woolen factory at New Mills, which they operated for many years. Richard succeeded his father and brother, Isaac W., in the ownership of the mills and water rights at New Mills, where he died in 1873. He was long a prominent and generous member of the Presbyterian Church at the Branch. Of his children only Benjamin Brewster and Alma Amelia, wife of Maj. John Greenville McNeel, of Texas, lived to maturity. 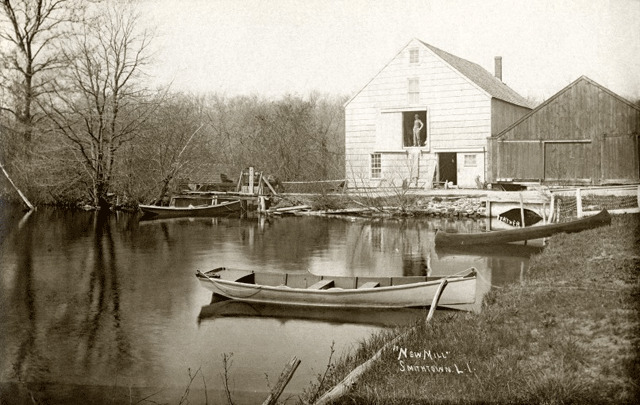 "The mills and water rights passed to his son, Benjamin Brewster, who was born in 1821 in the house of his grandfather, Judge Joshua Smith, at Hauppauge. Most of his life was passed in business in New York. In 1870 he inherited his grandfather's house on Bushey Neck, where he then took up his residence and where he died in 1892. He married Mary Duryee, daughter of John H. Brown, of New York. His children were: John B., Amelia, Anna B., wife of Theron L. Smith; Charles E., who married Isabel Cannon; Henry D., who married Mary Wardwell; Benjamin B., and Morgan B., who married Lucy M. Slade. The mills and property at New Mills are owned by his eldest son, John B., who is a merchant in New York, and his youngest son, Morgan B., now occupies the old place." Records of the First Presbyterian Church of Smithtown First Presbyterian Church of Smithtown (175 East Main St.), Suffolk County, New York 11787 - (631)-265-5151 Founded 1675 by Richard Smith on his land in Nissequogue, moved in 1750. The current church dates from 1825. Your site is absolutely wonderful and I so love the beautiful places shown. Thank you so much for your work and for sharing. 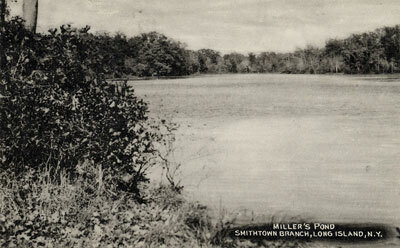 Miller's Pond, Smithtown Branch, Long Island, N.Y.